One day a few years ago a student came to ask Sonoma State University Chemistry Professor Steve Farmer a question during his office hours. The student was shaking slightly. When he asked why, Farmer was shocked to hear it was because the student hadn't yet eaten that day. It was then he realized the high cost of textbooks led to some students skipping meals to buy required books. Farmer knew at that moment he had to do something to help. "I found out that one of my class' books was $400 in our campus bookstore," he says. "So I started looking into alternatives to these expensive books." With support of the California State University Chancellor's Office, Sonoma State University has committed to reaching at least a 30 percent savings on books for all students with 17 faculty adopting Open Educational Resources in 23 courses, saving students roughly $180,000 in the fall semester alone. Textbook prices have outpaced inflation by nearly 400 percent, says Justin Lipp, director of the Faculty Center at Sonoma State. In a recent survey, SSU students reported spending an average of $670 per year on textbooks. While this is lower than the national average of $1,200, 98 percent of the 1,000 students surveyed agreed that the typical cost of instructional materials, like textbooks, is too high. Another eye-opening result from the survey was that 79 percent of SSU students reported experiencing financial hardship as a result of purchasing textbooks. Some students even say textbook cost has influenced the classes they take. Chemistry major Brian Warne says he has simply skipped purchasing a required book for a class, and has even gone so far as to take photos of a friend's textbook using his phone when he couldn't afford to buy the book. "Often times before even going to the book I'll go to Google instead, because what you're looking for pops up right away," he says. "And I think more and more students are doing the same thing." Required textbooks for Farmer's General Chemistry and Organic Chemistry classes used to cost each of the 200 or so students taking the classes $500 per year, and used textbooks are not as widely accepted as they once were. Farmer found that in the 1970s, new editions were released about once every six years. Now, he says, the average is once every two years, which effectively kills the used textbook market. Looking at two editions of his required general chemistry book, Farmer noticed little changes save for page numbers and the physical dimensions of the book. He was not alone in this observation, and discovered LibreText through UC Davis professor Delmar Larsen, who founded the site a few years earlier. LibreText pulls together public information already available online and allows professors to arrange it into sections to customize lesson plans or even entire textbooks. "The end result was a free textbook with the course topics in the order I wanted them," says Farmer. Sonoma State now has a defined site on LibreText. English Professor Brantley Bryant is on board as well. Working with four other scholars across the country, Bryant has produced an online, open access companion to Geoffrey Chaucer's Canterbury Tales (opencanterburytales.com), providing historical context and analysis for each of the tales. A rough version is available now, with a final version appearing this fall. Companions cost from $25 to well over $100, says Bryant, and often aren't well suited for introductory classes. His version is made for a global audience, available free online with permission given to readers or instructors to print and copy their own versions if they like. “One lesson I found working on this project was that my research life was absolutely essential to this,” says Bryant. Regularly attending conferences allowed him to seamlessly network with other Chaucer scholars to make the project a reality, and the open peer review process included students and professors from across the country. The result is the first Chaucer companion to be published open access, and one of the first to include treatment of race and racism, ecology and other topics that intentionally put the 14th century work of fiction in context with present-day concerns. Sonoma State University held a one-day Open Educational Resources conference on May 23, at which 25 faculty members learned what could be done to help alleviate textbook cost. At the conference, Leslie Kennedy, director of the Affordable Learning Solutions program for the CSU Chancellor's Office said students spend $300 million each year on textbooks. The CSU's goal is to halve that amount, and the Chancellor's Office is providing funding, resources and communication to get faculty and administrators at each campus on board. So far, she says, their actions including faculty stipends for exploring OER options, awareness workshops and working with campus bookstores to negotiate prices with vendors have saved $35 million for students. At Sonoma State, financial stipends of up to $1,000 are available for individual faculty to adopt a free or reduced cost textbook, and individual departments wishing to adopt a similar resource for a large enrollment course can be awarded up to $3,000 to help support instruction. Interested faculty can contact Lipp, Farmer or Rita Premo. The SSU Bookstore, which is owned by Barnes and Noble, has been supportive of the move toward OER textbooks. There is even talk that large booksellers may begin offering their own affordable textbooks using the LibreText model of customization, with prices far lower than traditional textbooks. One hurdle is raising awareness about the availability of OER textbooks. The SSU study found that 65 percent of students didn't know about this affordable option. There are also still some faculty who don't know about it, or do not see it as a viable alternative to the traditional methods. On the contrary, says Lipp, classes using OER textbooks actually see an increase in student retention due to the affordability of textbooks, with studies showing no noticeable difference in student performance. “This directly supports the CSU’s Graduation Initiative 2025 by making college more accessible for all students,” says Lipp. The initiative aims to double the system's four-year graduation rate by the year 2025. "For me, it was getting over this textbook mentality, which was developed before the internet was around," says Farmer, a recipient of Sonoma State's Excellence in Teaching Award. "When I started teaching, I thought you have to have a textbook for the course. That's how I learned to do it." But now the internet has changed the way students learn, and Farmer is adapting his teaching style to meet that of his students. Online learning is "the wave of the future," he says. 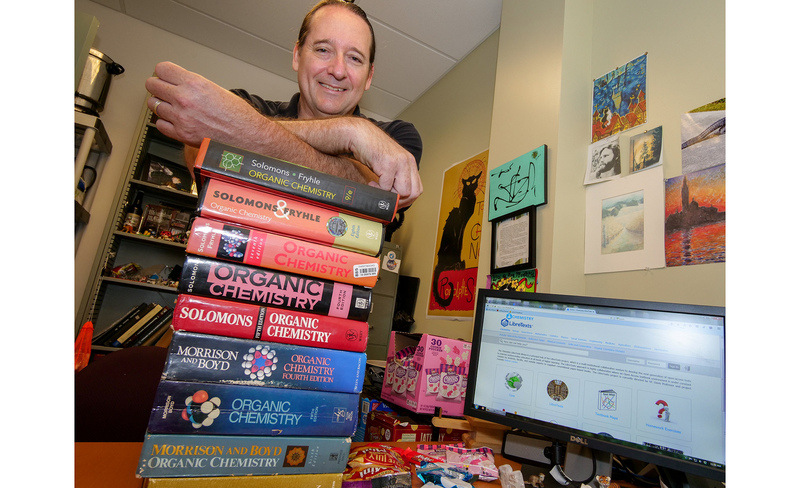 The tide is turning toward more OER textbooks being offered at SSU, but in the mean time Farmer still keeps a variety of snacks in his office for students whose food budgets are running low. "Students really appreciate it," he says. "I hear that all the time from them." Rent Digital - Offers students access to over 60,000 popular e-textbooks at a savings of 60 percent or more off the cost of new print textbooks through the option to rent e-textbooks thanks to agreements with publishers and bookstores. CSU Affordable Learning Solutions - Commercial publisher content, library resources and a wide array of Open Educational Resources available to faculty through CSU. California Open Online Library for Education (COOL4ED) - Free textbook selections for 52 of the most popular general education courses, made available through the CSU’s Multimedia Educational Resource for Learning and Online Teaching ​(MERLOT). Each textbook has been peer-reviewed and is accompanied by an accessibility evaluation. Faculty at Sonoma State University have a new type of "digital whiteboard" to reach students online and supplement classroom learning.